Kasuri is the Japanese word for textiles that have been woven with fibers that have been dyed explicitly in order to create geometric patterns and images in the fabric. It is the Japanese method for the ikat technique. 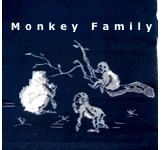 Kasuri is a traditional folk textile produced in Japan since at least the middle of the 18th century. Kasuri patterns have distinctive fuzzy edges and look as if they were splashed onto the fabric. The Japanese word “kasuri” refers to these blurry, feather-edge patterns and the textiles, clothing and bed covers they decorate. Japan certainly had early exposure to these kinds of fabrics when extraordinary silk kasuri textiles reached the islands in the 8th century through China. These historic Chinese kasuri textiles have been safeguarded at the National Shosoin Repository since their introduction into Japan 1300 hundred years ago and represent some of the world's earliest examples of known kasuri textiles. Japanese textile craftsmen didn’t adopt the kasuri dyeing technique early on. 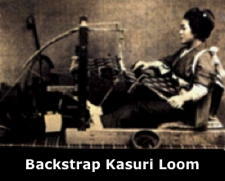 Kasuri had to wait until the 18th century to gain a solid foothold in Japan; a period when cotton became easily available and abundant through domestic cultivation and when simultaneously the kasuri weaving technique became firmly established in Southwestern Japan. To gain a better understanding of how kasuri became a common textile throughout Japan, one must first consider how kasuri found its way from other Asia countries into the Japanese Archipelago. Kasuri is also known by the Malay/Indonesian word ikat and was historically produced in Central Asia, South Asia and most of Southeast Asia. Kasuri textile production began in the Ryukyu Kingdom (now Okinawa) when, oddly enough, the abaca banana plant was introduced to the islands from the Philippines sometime in the 1200s. Though similar to the the common banana plant, Japanese “basho" plants are unique for their fibrous stems rather than for their fruit. The fibers in the "trunks" of basho plants are removed, split into fine strands, then tied together into thread, and finally woven into a superb cloth. This cloth is called basho-fu. The Ryukyu Kingdom began producing bashofu kasuri textiles in the 1300s for export to China, Korea, Southeast Asia and Japan. In 1609 the Shimazu Clan of Satsuma, Japan, invaded and subjugated the Ryukyu Kingdom. The hand crafted technique of resist dyeing kasuri patterns (tegukuri) must surely have entered Southern Japan at this time and cotton kasuri textiles were reproduced in Satsuma by the early 1700s. Production soon spread to northern Japan and were chronicled in the Nara area of Honshu Island by the early 1750s. At the same time, Japanese feudal samurai demanded that farmers grow more cotton to offset Chinese and Indian imports and in order strenghten the Japanese economy by enlarging the nacent domestic textile industry. As a result, cotton crops increased dramatically in the warmer southwestern Japanese regions where soils and weather were favorable. Farm families began growing cotton and weaving textiles for their own use and to sell for a cash income. At the time, daughters of impoverished Japanese farmers received little education and most of these children began to help support their families by weaving fabrics by the age of 8 or 9. In the Kurume area of Northern Kyushu Island a old tale is affectionately retold about how a skilled 12 year old local weaver named Den Inoue in 1799 discovered how to produce simple kasuri patterns. She is credited with creating the kasuri weaving industry in the region. By the 1850s kasuri production had spread to 3 other areas in Japan: (1) San-in on the Japan Sea Coast, (2) the Bingo area of south central Japan and (3) the Iyo area of Shikoku Island. Production rose quickly in these areas to challenge the fame of the already well established Kurume-gasuri. By 1900 farmer co-operatives produced kasuri extensively in many areas of Japan. Because kasuri was in hight demand, they sold their homespun and hand loomed fabrics even into the most remote rural locations as well as into urban centers. The domestic kasuri boom continued to expand up until the 1930s when national government controls and restrictions diverted cotton textile production away from local sources to low cost manufacturing in Korea and China by way of Japan's external military expansion. In an effort to further reduce production costs, pre-dyed threads were shipped to 75 prisons in Japan, Korea and China to be woven by prisoners as free labor as part of their confinement punishment. In 1928 prison woven cloth accounted for 54% of the total production. Kasuri textiles were primarily woven by farm women at home by hand on backstrap frame looms. A bolt or “tan” of cloth was about 29 feet long and 13 inches wide. This was the length needed to make a kimono. Cut into.four or five panels with their selvages sewn together a tan would also make a futon bed cover. Geometrical patterns were favored for kimonos and farm clothing and e-gasuri picture patterns for futon covers. At first the vast majority of kasuri patterns were geometrical: small dots, dashes, crosses, circles, squares and tic-tac-toe grids, called igeta similar to hash marks. These sorts of small geometric patterns are sometimes called “splash kasuri”. Later in the 1800s elaborate symbolic picture patterns were developed. These picture motifs are called e-gasuri in Japanese. Patterns from nature, old folktales, and auspicious symbols for wealth, happiness and longevity were popular. Many of these patterns, such as the pine, bamboo and plum (the three friends of winter) or the crane and turtle were culturally transmitted from China and are ancient felicitous motifs. The three friends of winter represent endurance, flexibility and new birth.The crane and sea turtle represent longevity, the crane said to live 1,000 years and the sea turtle 10,000 years. Crane and turtle patterns sometimes appear together with the Chinese characters for 1,000 and 10,000. Other picture motifs include sparrows or tigers in a bamboo grove, lion-dogs and peonies and plovers, often combined with geometrical patterns. Buddhist patterns such as Daruma, swastikas, religious hermits riding carp, the Seven Lucky Gods and temple guardian Shi Shi lions are also found. The joy of collecting and displaying these e-gasuri, picture patterns is endless. Geometrical patterns were used primarily for farm clothing, bedding quilts and kimonos. E-gasuri picture patterns were seen in futon covers, kimonos, cushions and door curtains. In the Kurume area large, auspicious patterns of shrines, castles and victorious war ships, done in double kasuri and covering 4 or 5 panels of cloth became popular around 1900. They were gifted as wedding futon covers and are the most expensive and auspicious e-gasuri textiles. They were usually produced on special order and are highly sought after by collectors. Wedding futon covers with auspicious patterns were an important part of any bride's trousseau. Although workshops and factories developed in the late 19th and early 20th centuries production costs were high and the cottage industry of home grown cotton, hand spun threads, naturally dyed and hand woven kasuri textiles remained strong and firmly in the hands of farm women and farmer co-operatives. Kasuri patterns may be dyed only on the weft threads, yoko-gasuri, only on the warp threads, tate-gasuri, or on both so as to form a common pattern when woven. This is called tate-yoko-gasuri or double kasuri and is found in only 4 or 5 locations in the world. 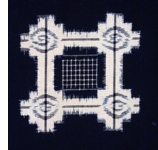 The Kurume area of Kyushu Island was famous for its double kasuri patterns which appear pure white on textiles. Weft kasuri and warp kasuri appear grayish or light blue in color as a balanced plain weave is used allowing both the kasuri patterned threads and the plain indigo threads running perpendicularly to be seen. Weft kasuri and double kasuri were often used together for different, alternating patterns in a single cloth or in different parts of a single pattern. Warp and weft kasuri were often used in the same cloth but only produced common double kasuri patterns where they happened to cross. This is called compound kasuri. Weft and double kasuri were the norm and warp kasuri was used mainly in compound patterns and only rarely by itself. The one exception is the arrow feathers pattern, ya-gasuri, which for technical production reasons ( warp shifting), is done almost exclusively in only warp kasuri. 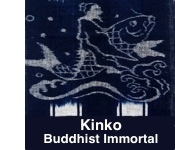 Natural indigo was by far the most common dye used for kasuri textiles. From the mid 19th century red accents and motifs became fashionable and this lead to the occasional use of other colors. 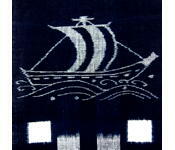 A number of dyeing techniques were used to produce the blurry edged patterns known as kasuri. At first, the labor intensive method of hand binding the patterns onto bundles of threads before dyeing them was used. This resist dyeing technique is known as tegukuri (hand bound or tied) kasuri in Japanese. Tegukuri-gasuri is often compared to ikat when describing this specific, resist dyeing technique. As demand for kasuri textiles grew in the 19th century, however, other dyeing techniques were developed to speed up and increase production by eliminating the time consuming step of hand tying the patterns on the threads. Itajime (board clamp) kasuri was developed in many areas for more rapid and economical production. This type of kasuri is resist-dyed by placing a layer of arranged yarns between engraved wooden plates. The plates are bolted tightly together and when dye is introduced the pressure of the high areas acts as a resist, reserving the patterns. This eliminated the time consuming work of binding patterns by hand and the engraved boards could be used over and over to economically produce popular patterns. Many engraved plates were used in stacks sometimes three feet high with the arranged threads stretched tightly back and forth between the layers. If the background is carved down a traditional blue textile with white kasuri patterns is produced when indigo is poured into the cavities between the boards. Another unique type of kasuri known as shiro-gasuri (white kasuri) was produced by carving down the patterns and leaving the background high. This produced a white textile with simple, geometrical patterns dyed in brown or blue. The Nara area was famous for hemp textiles dyed in this manner which were known as Yamato-gasuri. They were primarily used to make men's kimonos. This type of kasuri was being produced in the Nara area as early as 1760. Later, more complicated picture patterns were also produced using the itajime method. Another method was the use of stencils to apply a rice paste resist, either clear for white patterns or with red dye added for red patterns and highlights, to warp or weft threads stretched in a smooth flat layer on a special frame. The rice paste, when dry, saved the patterns on the threads, rather like batik, when the threads were vat dyed in indigo. 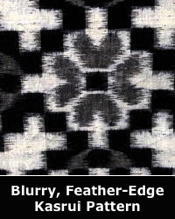 Slight shifting of the threads when they were placed on the loom (warp threads) or woven in (weft threads) produced the blurry edges characteristic of kasuri patterns. In modern Japan, home weaving is a forgotten talent and now days kasuri textiles are dyed and woven only in a few arts and crafts workshops, encouraged with the aid of government subsidies. Some of the kasuri textile artists have been designated “living national treasures” and the textiles they weave in old traditional methods command very high prices. Antique kasuri textiles, hand woven from hand spun thread and dyed with natural indigo are becoming more difficult to find as time presses. In the not too distant future, we may only rarely see exceptional kasuri textiles in museums and private collections. The few remaining antique kasuri textiles that still trickle out of the Japanese grandmother's cedar chest are truly rare and represent rapidly vanishing treasures from a glorious past. and photos by including a link back reference (required) to this page or our site's front page. link to them from this site.